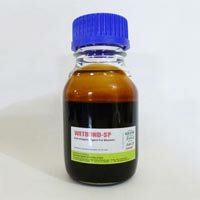 We are a leading Manufacturer & Exporter of Anti-Stripping Agent. 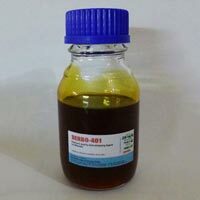 We fabricate Anti-Stripping Agent using quality material under the strict vigil of supervisors. Our Anti-stripping Agent is a green chemical that reduces water induced damage to bituminous pavements and extend the life of the pavement. 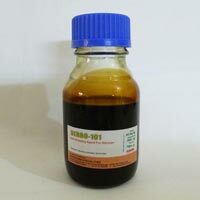 The Anti-Stripping Agent that we provide is used at the time of road construction with conventional hot-mix surfacing. 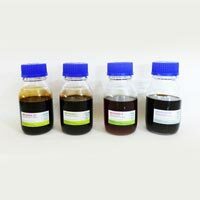 It also helps in reducing the dosing of bitumen in asphaltic work as a result of which it is widely demanded in the market. 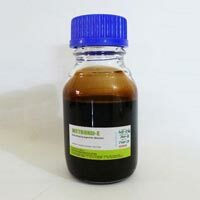 We make Anti-Stripping Agent available at reasonable prices. The Premature failure of Bituminous Pavements due to action of water is the most common problem and single largest factor causing early pavement distress. The most important reason contributing to this condition is improper adhesion between bitumen and commonly used aggregates, salt contamination of water/soil and water drainage problems. Majority of aggregate show high value (as high as 70%) and most of them fail miserably in bitumen adhesion properties. These conditions prevail across continents, thus all around the world, Anti-Stripping Agents are recommended and used to extend pavement life. Rain water seepage through shoulders, cracks or pores, ground / sub-surface water exhibiting a hydrostatic action (moving inside bituminous layer). Water vapors formed in the sub grade due to hot weather. Siliceous type and dusty aggregates. Presence of clay on aggregate surface. 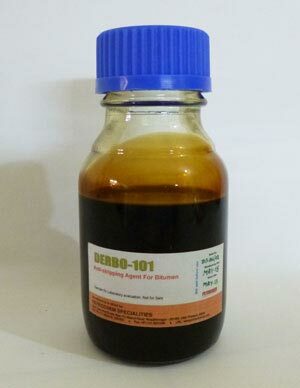 Bitumen with higher acidity profile. Mix designs with less binder and open grading of aggregates. Material with higher voids due to improper compaction. Presence of water vapors between layers. 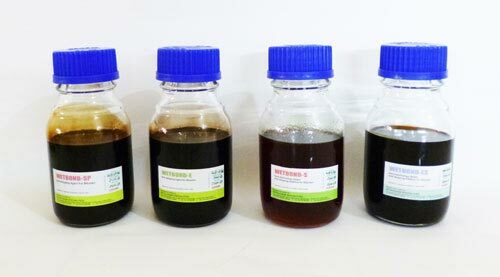 The chemical affinity between bitumen and aggregate can be improved by the addition of very small quantities of chemicals which change the nature of the aggregate or the bitumen to have more affinity for the other. 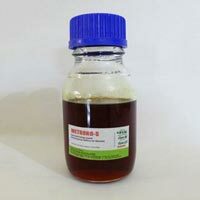 These chemicals are known as Anti-stripping Agents "Anti-stripping Additive" or adhesion promoters. Since the stability of bituminous pavement largely depends on adhesion between bitumen and aggregates, the ionic nature of aggregate is an important factor explaining the problem of stripping that differ for different type of aggregates. This also explains non-formation of stable bond in bituminous pavement construction. (refer IS-6241:1971 Method of test for determination of stripping value of road aggregates, ASTM D3625 "The Boiling Water Test"). Prolongs the pavement life by slowing the ageing process.. 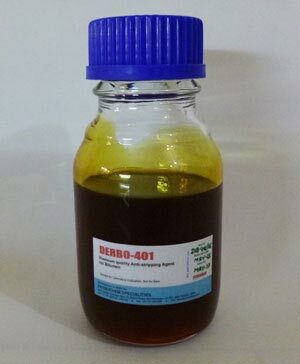 The problem of stripping can be effectively minimized using DERBO and "WETBOND" range of anti-stripping agents. Since they are made from polymeric amines, the amine group of DERBO and "WETBOND" anti-stripping agents reacts with acidic aggregates and makes the aggregate surface hydrophobic (repulsive to water). Further lipophilic (oil loving) Fatty chain remains well suspended in bitumen to form a bridge between bitumen and aggregates. This prevents stripping even in presence of water. 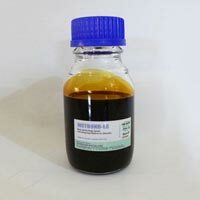 Amine based DERBO and "WETBOND" Anti-stripping agents also act by changing the interfacial tension between Bitumen and aggregates and strengthening the bonding for long term durability. In construction of bituminous pavements, the aggregates are used in two ways e.g. in coated form (Hot Mix etc.) and uncoated form (spraying work etc.). 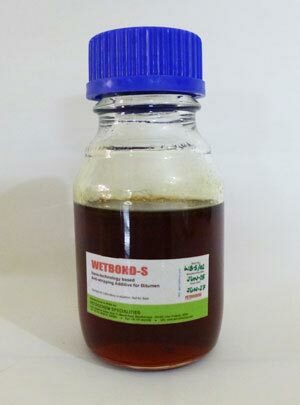 When used in proper dose, DERBO and "WETBOND" are equally effective in both the applications. In coated form they prevents stripping even when coated aggregates are submerged in water and in uncoated form they provides active adhesion of bitumen even with wet aggregates. Around the world, Antistripping agents are used to enhance the performance and durability of Bituminous pavements. Since stripping is a widespread problem in India also, The Ministry of Shipping Road Transport & Highways has specified the maximum stripping value of 5% for the Bituminous pavements. 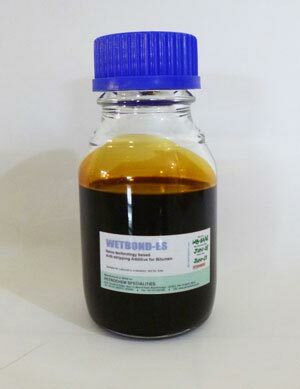 Provide saving by optimizing the Bitumen requirement in the mix. Provide fast coating of chips due to surface active action. Reduce requirement of fines in the mix. Help in easy compaction of the mix ensuring better surface texture. Improve Retained Marshall Stability for high rainfall area. Help the construction of roads during damp climate. Save road from freeze-thaw in snow-bound areas. Save upto 50% in maintenance cost. Help in stable road maintenance even using wet aggregates. 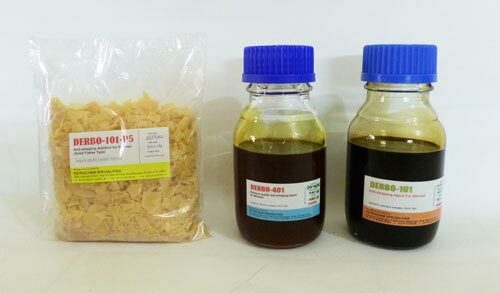 Dosing of DERBO and WETBOND can be done at different stages of mixing and application. An automatic dosing system can be installed in hot mix plant, however an easier way is to add pre-determined quantity in bitumen storage tank before unloading the bitumen from bulk tanker. 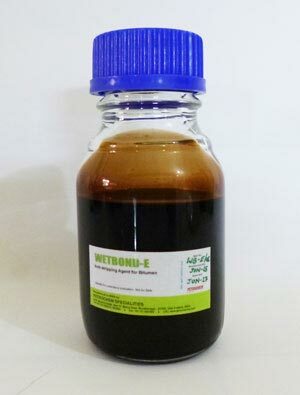 Alternatively it can be mixed in stored bitumen by gentle stirring for 15 minutes by a mechanical or manual process. The required dose of each grade will be different depending on type of bitumen used, type of aggregates and type of surfacing. (The dose can be estimated by some simple tests covered under testing page). Hot-Mix Surfacing : Hot Mix surfacing is the most efficient and preferred road construction technology. This however requires stringent control of performance features like stripping which most of the times shortens the pavement features and life. This problem can be minimized by using small doses of DERBO or WETBOND that also results in Bitumen saving and good saving in maintenance. Surface Dressing (Chip-Sealing) : Surface dressing (chip sealing) involves spreading uncoated chippings over a sprayed layer of Bitumen followed by rolling. The applied Bitumen layer cools rapidly leading to wetting problems which become worse by wet and dusty aggregates. 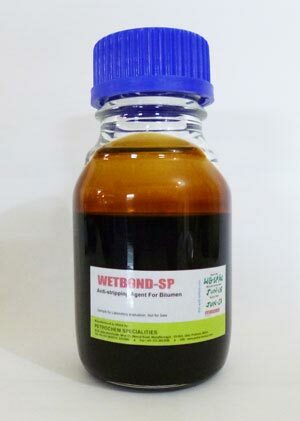 In this case an active adhesion is required and typically 0.5-1.0 % DERBO or WETBOND is added to the bitumen. 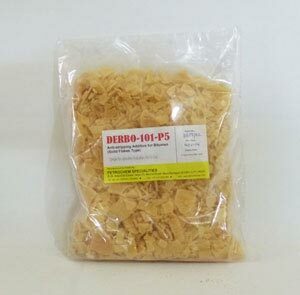 Alternatively the chippings can be pre-coated with a mix of diluted binder and WETBOND or a diluted water solution of DERBO can be sprayed on chippings before spreading. Field studies have demonstrated that the use of Anti-stripping Agents in surface dressing provides resistance to early rain. Maintenance : When repair works like pot-hole filling, crack sealing, rutting etc are carried out in rainy season or where possibility of moisture damage is high, a little addition of Anti-stripping Agent ensure stable repairs. Hot Recycling : When a pavement is subjected to hot-recycling, if partly coated surfaces are observed in the reclaimed mix, to provide easy wetting, better water resistance and better compaction, Anti-stripping Agent should be used. Cationic bitumen emulsions provide good adhesion in road applications but sometimes an additional water resistance is required. 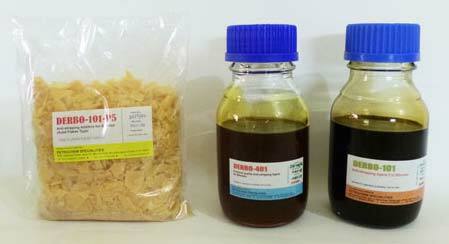 Anti-stripping Agent can be added to the binder before emulsification. Anionic emulsions generally provide poor adhesion to siliceous (acidic) aggregates. 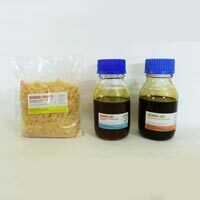 Adhesion of anionic emulsions can also be improved by adding Anti-stripping Agent to the binder before emulsification, or to the finished emulsion. Precoated Chippings : When chippings are lightly coated with bitumen, kerosene or diesel to ensure adhesion in surface dressing or when rolled into hot rolled bituminous surfaces to improve skid resistance, Anti-stripping Agent can be added to the coating material to ensure good adhesion.Prime Coats : Where cutbacks are used for priming and dust control during construction, since road base retains moisture and remains cold, Anti-stripping Agent should be added to the prime coat to ensure active adhesion and protection from moisture.